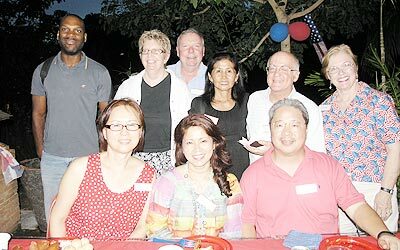 American Independence Day 2008 was celebrated one day early, on July 3, at the US Consulate compound, hosted by the Consul General Michael Morrow and the Veterans of Foreign Wars Post 12074. Luckily, and much to the relief of the organisers, the rain stopped just in time for the event’s opening at 4 pm, followed by the sun favouring the crowds with an occasional glance in their direction. Now that was one good cake! Guests were treated to some good ol’ American food; burgers from McDonald’s and Mike’s Burgers, pizza from Paradise Pizza, baguettes from Subway and great coffee and cakes from Starbucks. Bud’s Ice Cream, not surprisingly, had the longest queue throughout the celebrations! 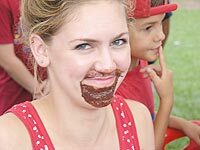 Just under 1,000 guests showed up, ranging from a couple of octogenarians to babes in their prams, many wearing colourful red white and blue hats, shirts and pants. 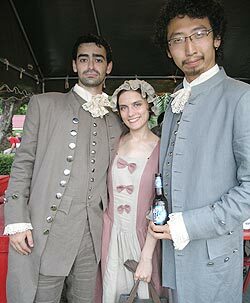 There were even three of the “founding fathers” - well, two actually; because one was a ‘mother’ who came as Abigail Adams, who was the 1st Second Lady and also the 2nd First Lady! 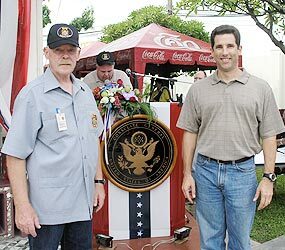 US Consul General Michael Morrow (right) with co-host of American Independance Day celebrations Mike Holmes, Commander of Post 12074. Julie, Dominique and Mary enjoying the food and drink on offer. After a display of fireworks, at the end of the evening there was a ceremonial Lowering and Securing of the Colors by currently serving soldiers, with a guard of honor provided by veterans from Post 12074. 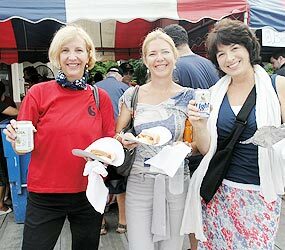 Most agreed this had been one of the best Independence Day celebrations held in Chiang Mai in recent years. As they left, guests were reminded about voting in the Presidential Election later this year, and advised on the procedure of voting from abroad, either at the Consulate offices on August 7 between 9 am and 11 am or via the internet at www.votefromabroad.org. If you are planning an event, why not invite [email protected] to help make it that little more special? Acacia and Anna, two of the younger generation, enjoying the ‘perfect day’. The Founding Fathers (and one founding Mother). Shannon, Valerie and Lindy working behind the ‘America Stall’ selling anything that was Red, White and Blue. Mike See, Bill Horner, Mike Holmes and Stan Gamester from Post 12074. The boys from the Montfort Band. 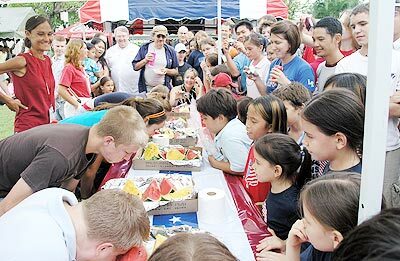 The Watermelon Contest proved one of the highlights of the day. 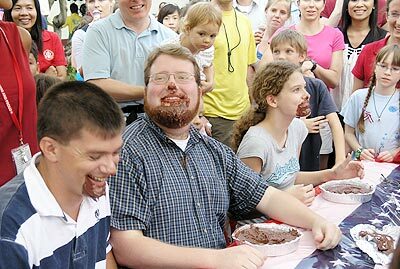 The winner of the Pie Eating Contest. Nellie Yagmi singing ‘America the Beautiful’ backed by the Montfort Band. Dr. Chao Duangduan na Chiengmai (centre) with Apinone Kiratibhumidhama (3rd left) and Ongkarn Chaiongkarn (right). Northern Village at Airport Plaza saw the opening on July 6 of a fashion event entitled “La Tenth Forest,” showcasing the work of the young and talented dress designer Apinpone Kiratibhumidhama. 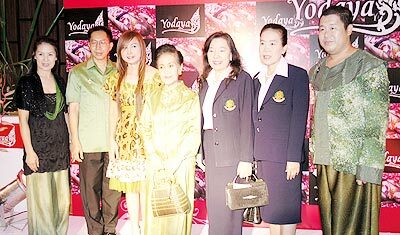 Organised by the very able Ongkarn (Jojo) Chaiongkarn, president of Public Relations & Marketing’s Association of the North, the guests of honour included Dr. Chao Duangduan na Chiengmai, and featured glamorous young male and female models including a superstar from Bangkok, Polar Issawa. Apinpone, who studied at the East West Japanese Language Institute, Tokyo Masuda Gakkuin in Japan, launched her new collection with the theme ‘Back to Natural Products’. Examples of her designs were used recently in Anchalee Kalmapijit’s Elephant Life Experience Fashion Show. All her designs are made up in Chiang Mai; ‘La Tenth Forest’ featured daywear, casual, and elegant eveningwear created mainly for younger adults - although some pieces could easily be worn by the older generation. For good measure, there were a few bare-chested young men showing off unique belts with a Native American Indian theme. Although Apinpone told the Chiang Mai Mail’s reporter that her favourite colours are black and white, most of the outfits were extremely colourful. On the catwalk itself, forming an effective backdrop, was a jungle of large leaves and branches, emphasising the “natural forest” theme. The launch, attended by over 100 guests from around Chiang Mai, plus 30 paparazzi, was catered by ‘Noom’ from Nasi Jumpru (Tel 081 831 9325). For those who would like to own one of Apinpone’s stunning creations, discounts of up to 70% will be available until the end of July. Glynn, KIm, Frank, Becky, Richard and Denis (l/r) posing for the camera. 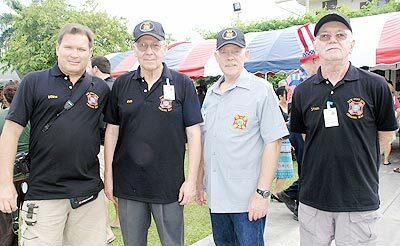 Richard Dixon, Nat Chowmuang, Frank Weicks and Becky Lomax again hosted a celebration of America’s Independence Day at CDC Design Resource near Lamphun. 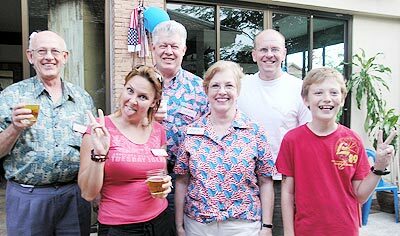 A decidedly international group of guests met in Chiang Mai for a parade to the grounds, waving red, white and blue balloons all the way. 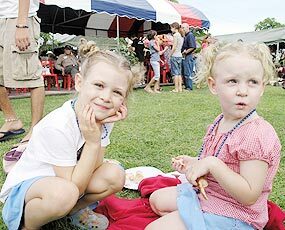 The grounds were decorated with red, white and blue wind socks that blew gaily from the trees, red and blue balloons, and red and blue chairs. The color scheme was carried through to the tables, and both an American and a Thai flag were flying. Every guest brought abundant food that ranged from barbequed chicken and ribs to potato salad and slaw. A perfect chocolate cake and an ice cream cake topped it all off. The factory dog hid under the shrubbery, but was proclaimed the “security dog” despite her disgrace. A portion of the Official American Presidential Independence Day message was read, and guests further celebrated with games and singing. David Crisp played patriotic favorites, and was rewarded with a tin of tea as a gift of thanks for his musicianship and “to make up for that tea-in-the-harbor incident,” all said in good fun! Games included an egg toss, and for the second year in a row the Thai participants were outstanding. Fewer broken eggs were counted near their feet than anywhere else. The winner was awarded “$100 worth of gasoline,” which was in reality a small bottle of tea. Winners in the “shave the balloon” contest were awarded a “gift certificate” and a “book,” both with satirical content. Whilst a charming donkey stood ready for “pin the tail on the donkey,” guests were having too much fun to stop and play the game. A decidedly non-professional but beautiful fireworks display was provided from the safety of the lily pond. This year all of the fireworks went straight up as they were intended to do, and the sky lit up with beautiful colors. The final event was the release of an enormous khoom loy in celebration (according to Richard) of the end of the current political administration and in hope of good things to come. The evening was one of good fun and good spirits, with guests bringing food and drink, leading games, and enjoying a relaxing evening together. 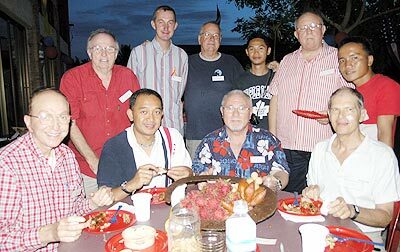 Richard, Murray, Bernard, Nop John, Amnoy (standing) with Joe, Sak Milt and James (seated) tucking into some great food on Independence Day. with Yoon Cha-on and Jimmy (seated) before the games began. For the first of a series of articles on resorts in and around Chiang Mai, we decided to head north from the city. Having lived here for several years, I had never been past Chiang Dao; so we decided to drive north on Route 107 towards Fang. My friend had been to Fang before - and had told me he did not know of a decent hotel or resort within the area except for the new Saimoonburi Resort in Chai Prakarn. The journey from Chiang Mai is 120 km and took just over 2 hours 15 minutes, driving at a leisurely pace. Finding the resort, which is located approx 22 km before Fang, we checked in and used it as our base for relaxing and exploring. Main entrance to the restaurant. Chai Prakarn is a typical Thai modern town with all the usual amenities such as banks, shops, chemists, restaurants and bars. Upon arriving in the town, Saimoonburi Resort is on the left, just after the road widens into a dual carriageway. At the entrance is a popular stylish coffee shop called “Coffee Hi”. A long driveway leads into the resort itself, set in beautifully maintained gardens within which are a collection of modern Bali style buildings. The hotel itself appears to be a well built luxury home - we later found out it actually was and has been painstakingly turned into a resort over a several year period. 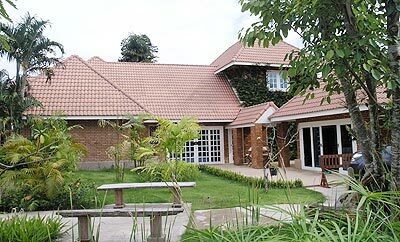 The main house, modern Asian style, now consists of 6 bedroom suites, all with en suite facilities. Three of the suites have large double beds, one has two single beds and two suites feature smaller single rooms. Every suite is different, but all have satellite TV, minibar, and fridge. Rooms are elegant and practical, several open on to what appears to be your own private garden, some also look out onto the lake. The bathrooms, in most cases, are large walk-in shower facilities, with all the monogrammed toiletries one would expect from a 5-star hotel. The building would be ideal for a family or a small group of friends travelling together, and offers all the privacy of your own home. At this point it must be said the whole, almost new, house is extremely clean and well maintained. The 15 meter swimming pool is not chlorinated but is salted and is totally private, surrounded by palm trees. In the changing room we found a small sauna. Upon closer inspection, the environmentally conscious guest will find an installation of solar panels. The 15 metre swimming pool. 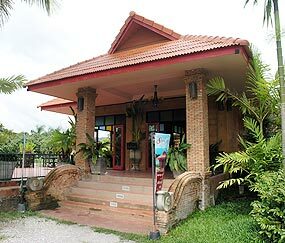 Dinner is served in the ‘Baan Suan’ restaurant, a totally separate lakeside building very popular with locals. 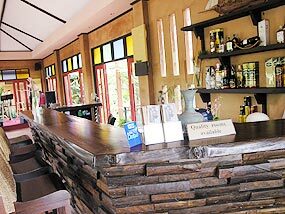 There are five separate areas in the restaurant, live Thai and Western music and plenty of efficient, friendly staff. We shared four dishes between two of us including the signature dish “Seafood curry in a cap” (cooked in tin foil) at 90 baht which was exceptionally tasty - the entire bill came to 600 baht including drinks. All in all, the food was excellent and at great prices compared to Chiang Mai. The restaurant has a special “Chinese banquet” on offer which I intend to try on my next visit with a group of friends. Breakfast is served to order in “the breakfast room” adjoining the main house including plenty of fresh coffee, while ‘Coffee Hi’ has a selection of coffees (35 baht), teas (25 baht), a bakery and wireless internet connection. We decided to head off to Fang for the evening, where there are 4 or 5 clubs and bars, popular most nights with a young crowd of Thai people and a splattering of foreigners at the weekend. Local attractions include Doi Wiang Pha National Park which covers an area of 364,375 rai and also Mae Fang National Park (378,125 rai). They are home to various species of wild animals including jungle fowl, wild pigs, pythons and a colourful variety of birds and butterflies. Besides its fresh, cool climate, Mae Fang also boasts spectacular waterfalls, caves and hot springs - one of its most spectacular attractions is the Tard Mork waterfall. Activities include mountain climbing, cave exploring, forest trekking and nature sightseeing. The Fang Hot Springs are located in a 10 rai plot of land with the largest pond having hot steam rising 40-50 meters above the ground, popular with locals and travellers alike who luxuriate in the natural baths and steam rooms while others boil eggs in some of the smaller ponds. Doi Angkang is a “must visit,” for its sheer beauty and amazing views whilst staying at the Saimoonburi Resort. Many of the local hill tribe people live in this area. Additionally, a recently discovered ancient forest offers forest walks amidst ponds of crystal clear water. Even after exploring all this, there is still plenty more - if you get lost you never know where you might end up. Give yourself a day to get back to Chiang Mai, possibly stopping off at Chiang Dao to visit the caves. Prices at Saimoonburi vary from 900 baht per night up to 3,500 baht. Deals can be done for large groups of friends or a family requiring more than one room. 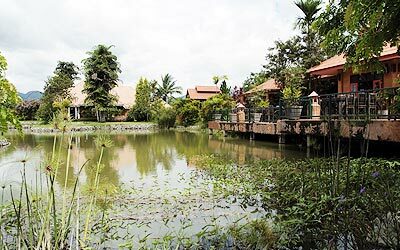 The resort is convenient for exploring in the area, yet in town and therefore close to all amenities - it’s also the perfect place to stop over on the alternative route to Chiang Rai and Mae Sai as the air is much fresher and cleaner throughout the year. Many local dignitaries visiting Fang have stayed at the resort - the staff speak good English, and can give good tourist advice. All in all, Saimoonburi Resort could definitely be described as a “home from home”. For further information, visit the website at http://www. 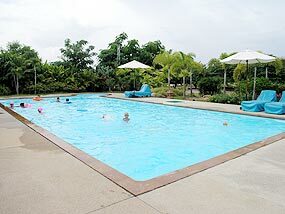 saimoonburi-resort.com. If you have any suggestions of a resort which you feel should be reviewed, please contact aroundtown @chiangmai-mail.com.